Samus commits metroid genocide in the second and weakest game of the series. I didn’t think I’d say it, didn’t want to say it, and certainly didn’t expect to say it when I started this profile last week. I like the Metroid series as much as anybody, and I’ve got the same stories to tell about playing the series over the years: meticulously making maps of the original Metroid, and learning the hard way not to confuse ‘0’ with ‘O’ or ‘o’ when writing down the passwords. Playing through Metroid 3 and going crazy trying to figure out how the *$%& to get into Maridia, then finally figuring out that I was supposed to use a super bomb on the glass passageway after watching the attract mode for a while. Playing through Metroid Prime and switching to the scan visor every five seconds, trying desperately to get all the log entries, and buying a GBA link cable just so I could link up Metroid Fusion and play the original all over again on the Gamecube. I didn’t think so when I first played it way back in 1992; back then it seemed like a reasonable followup to one of the greatest NES games ever. More weapons, arguably better graphics (or at least more detailed, if less colorful), more info on the Metroids, and best of all, more Samus, after an absence of nearly 5 years. No matter that the SNES was beginning a software war with the Genesis, both offering far more interesting titles to play, no matter that the original Game Boy sucked down batteries like a vacuum and had the ergonomics of a thumbscrew, no matter that staring at the grainy, blurry, ill-defined LCD screen probably added two or three prescription points onto my already half-blind eyes: I had a hard-on for Samus, and playing through Metroid II was the only way I could get my groove on. So, personal yammering aside, what does a player approaching Metroid II see now, 11 years after its initial release? On the surface, Metroid II has some good points; compared to most of the other Game Boy games out at the time, it’s head and shoulders above in control, detail, graphics and gameplay. 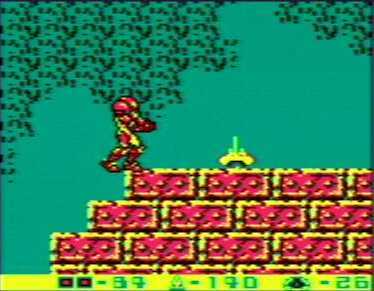 Even compared to the original Metroid, it has some distinct advantages: the game engine’s no longer limited to scrolling in one dimension, so rooms can be several screens high and several screens wide. Samus’ character is more detailed, and there are considerably more weapons and items: four distinct beam weapons as opposed to two in the first game, two new add-ons to the morph ball, and the space jump, which effectively allows Samus to fly. The plasma and spazer beams aren’t that impressive this time around, but the spring ball, which allows Samus to jump while in ball form, is pretty useful, and the spider ball, which allows Samus to cling to virtually all walls and ceilings, is just damn cool. But beyond that Metroid II’s facade begins to crack. Unlike Metroid 3, which had a wide variety of areas, each with their own challenges (or Metroid 1, which felt like it did) Metroid II is composed of an unbroken sequence of mostly homogenous caverns, and while the developers did their best to make some areas feel different from others by giving the walls different textures, every area in Metroid II looks the same after a while. Nor is Metroid II’s level design up to snuff in comparison to any other games in the series. Virtually from the beginning, Metroid’s levels have been a honeycomb of secret nooks and passages leading from one chamber to another, tying everywhere to everywhere else if you only know which way to go. 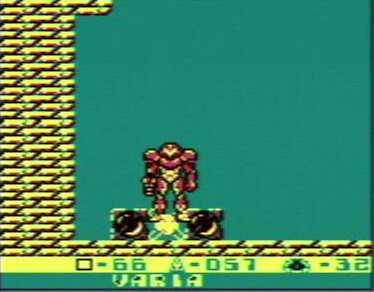 At the best of times, levels in Metroid are arranged in onion-like layers: the player moves through one level, acquiring items and completing objectives, unaware that there are other, more intricate worlds just beneath their feet or above their heads. But in Metroid II, rooms and levels are tied together like a hundred other games: move through one, do what needs to be done, then move to the next, without much need for exploration or backtracking. According to the back story of the game, Samus has gone to planet SR-388 after defeating the Mother Brain on Zebes, intent on destroying all the Metroids in their home lair. The game occurs almost entirely inside a set of caverns within SR-388, as Samus tracks down the 39 Metroids and eliminates them one by one. Each area has a certain number of Metroids Samus must defeat; when she does, an earthquake occurs and lava at the very bottom of the level recedes, leaving Samus free to move on to the next level and kill the next set of Metroids, ad nauseum. 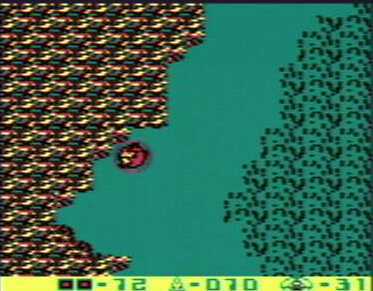 While the player can backtrack to any point in the game at any time, there’s no point in doing so; the game might as well have been divided into the discrete levels of most other NES and Game Boy games. Moreover, within each level the size of each room is large, but the number of rooms and the number of enemies within each room is small… and some rooms are just long corridors with no enemies, pits, or other points of interest at all. Nor is it much of a challenge to hunt down each level’s Metroids: each level is of finite size and it’s rarely difficult to track down everything inside within minutes. There’s even an indicator to tell how many Metroids are left within the game and within the area; not since Nintendo’s original PlayChoice 10 arcade console has the amount of "fun" left been so finely metered out. And as for the metroids themselves… what a tragedy. 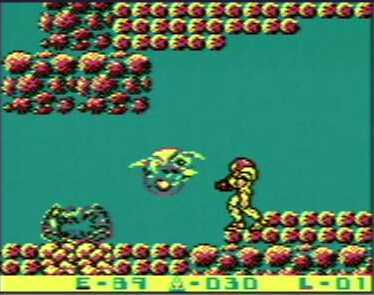 The original metroids were finely executed sci-fi monsters, held off in mystery until the end of the game, difficult to kill, and even a bit thrilling: certainly few other video game enemies have given players such a sense of "GET IT OFF ME" as the original metroid. In Metroid II, the player is first confronted with the idea of "evolving" Metroids, an idea put to good use in Metroid Prime but poorly executed here. Whereas the original metroids could only be defeated through skillful timing and the use of ice beams and missles, these evolved metroids merely need to be blasted with missles to be killed off. There are four different types, but virtually all simply charge Samus until somebody dies. Defeating these metroids isn’t so much a question of sharp reflexes but of mere endurance – make sure you’ve got enough energy and missles and you’ll be fine, have less than a certain amount and you’re virtually certain to die. Unfortunately, that’s also a great description of the final boss battle. All other Metroids aside from II have had good and memorable minor and major bosses scattered throughout the game; who doesn’t have fond memories of Kraid from Metroid 1, or the Mother Brain from Metroid 3? But instead players of Metroid II are treated to one of the longest, most tedious boss battles ever: the mother metroid, a large dragon-like beast that has a grand total of one attack pattern, used over and over. 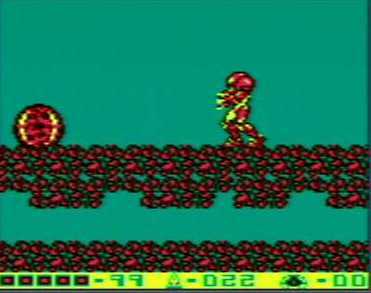 Someone playing Metroid on a Super Game Boy with access to a programmable controller could likely program a macro to defeat this enemy; Samus jumps some fireballs, dodges two snap attacks, fires a missle, repeats. That’s all it takes, but since it takes 150 missles to defeat the mother metroid (5 times more than any other enemy in the game), it can take up to 15 minutes to defeat the beast. Perhaps the first time through beating the mother metroid felt like an accomplishment, but after facing off against the Metroid Prime, it feels like a cruel joke. Of course, after the mother metroid gets defeated, Metroid II moves on to its sole plot point – Samus discovers an infant metroid, the last on SR-388, and uses it to help her escape the planet. Interesting from a completist’s standpoint, but if you’ve seen the beginning to Metroid 3, you’ve got the gist of it. It’s not nearly sufficient payoff for the tedium that’s the actual game of Metroid II.